In opposition our role is clear. Providing challenge to help hold the Labour council to account. That way we can help protect how your hard-earned council tax is spent. Martin Bashforth is looking forward to the opportunity of caring for the 3 communities of Coppull West, Charnock Richard and Heskin, as our councillor Paul Leadbetter steps down after 8 years. From his time in the armed forces, Martin Bashforth is no stranger to helping the public and dealing with matters of great concern and consequence to others. Besides time served abroad. Martin has lived in Chorley all his life and once only the best for his town and local area. This is why Martin has concerns of the Labour-led councils running of the town, the overspending on poorly planned projects like the little used decked car park on Friday Street in Chorley and the empty office block that was penned as a “digital health park” as a part of the Strawberry Fields development. 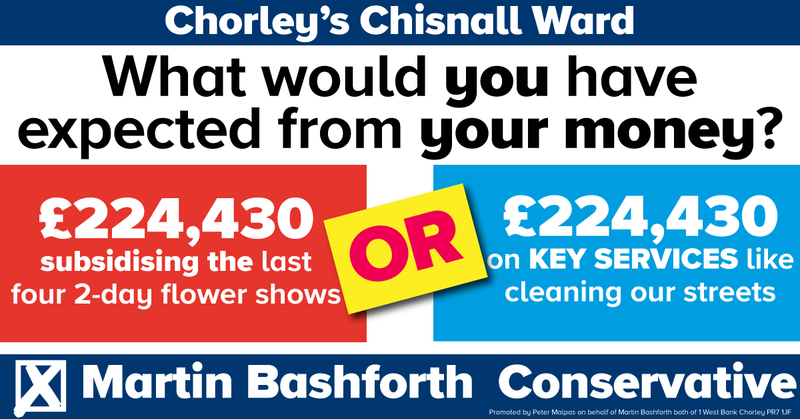 As well as central issues, Martin wants to focus on what's important in our Chisnall Ward. These include speeding concerns, working with the County Council to fix our roads, inappropriate development of the green belt with no concern for local amenities along with any issues of local concern that need attention.